Talk about an incredible friend, right? Her words were perfect. And, they were perfect because I know the Lord was using her to speak to me. So, I bought the book immediately and here I sit, reading and loving every bit of it (and I’m hardly past the introduction). I wanted to share a passage from it that really struck me. “One day I was trying to make a mental list of the lies that were driving some of the dysfunction in my life. The exercise turned out to be much more complicated than I had anticipated. And I’ll tell you one reason why the thing that makes deception so effective is that you can’t detect it. The chatterbox doesn’t preface its lies with an announcement: Attention! The thought you’re about to think is absolutely toxic, designed to lead you away from the good and perfect will of your loving heavenly Father. Instead, like a distortion pedal, the chatterbox manipulates the truth. So it won’t sound like this: Perhaps you should take steps toward spending more focused time reading your Bible, because God has so many promises and truths He wants to reveal to you today. More likely it will sound like this: If you really loved God, you’d spend more time reading your Bible, like people do who have their priorities in order. Both of these statements contain a seed of truth. The seed is I’m not reading my Bible enough, I should read it more. Yet the essential messages couldn’t be more opposite. Listen to the undertones of the second statement compared to the first. The first statement is rooted in a spirit of affirmation: God desires to speak to you. And it is presented in the form of an invitation – to come into His presence and receive the good things He has to offer. It suggests a realistic course of action: you don’t have to reinvent your life overnight – just make some steps towards your destination. The second statement is rooted in the spirit of condemnation: You don’t really love God. This is a gross exaggeration and misinterpretation of the motivations of your heart. And it’s followed by an accusation: Other people love God more than you do. You don’t measure up; you never have, and you never will. Why do we let ourselves talk to ourselves this way? Maybe because the internal dialogue is happening much faster than our current level of training has enabled us to defend against. The Enemy has quick hands that land swift, accurate blows. Also, sometimes perhaps we stand by passively, waiting for God to fix the issues that He’s called us to fight in His strength. If we’re going to overcome the thoughts that hold us back, first we have to give up the hope that they’ll ever go away. every second you spend wishing God would take away a struggle is a forfeited opportunity to overcome. And even thought the fight against chatter is guaranteed to be a grueling one, with no end in sight, you have to fight back. Your spiritual life depends on it. Ah. What an incredible last statement. “Because the voice you believe will determine the future you experience.” Which voice are you listening to today? 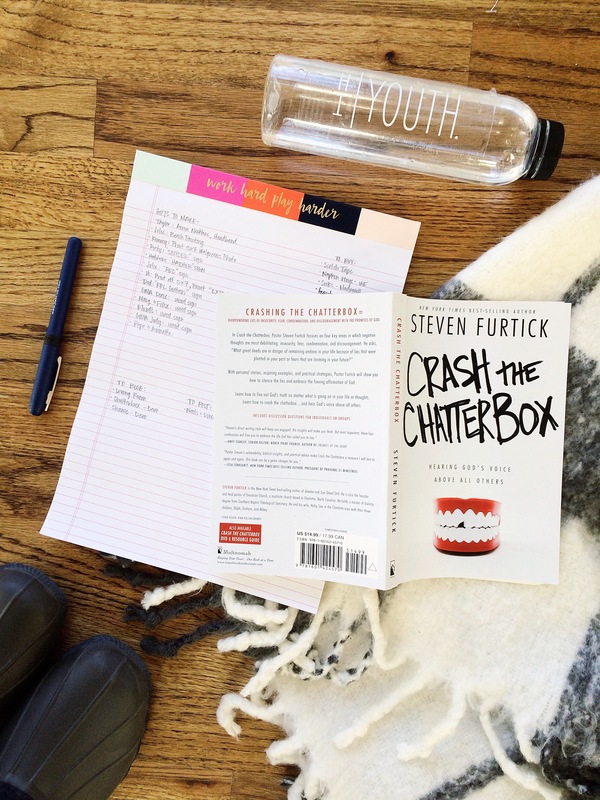 Where has the chatterbox kept you from moving forward? What’s holding you back? This is awesome Ash. People have to realize that salvation isn’t a one time thing its a LIFETIME thing. Salvation isn’t about the “sinners prayer” and then you go back to your old life. Nowhere in the Bible does it say that is all it takes. Following Him isn’t easy. Striving to be holy isn’t easy. But it is what He commands us to do. Thank you for sharing this! Exactly! Couldn’t have said it better myself. Thank you so much! !